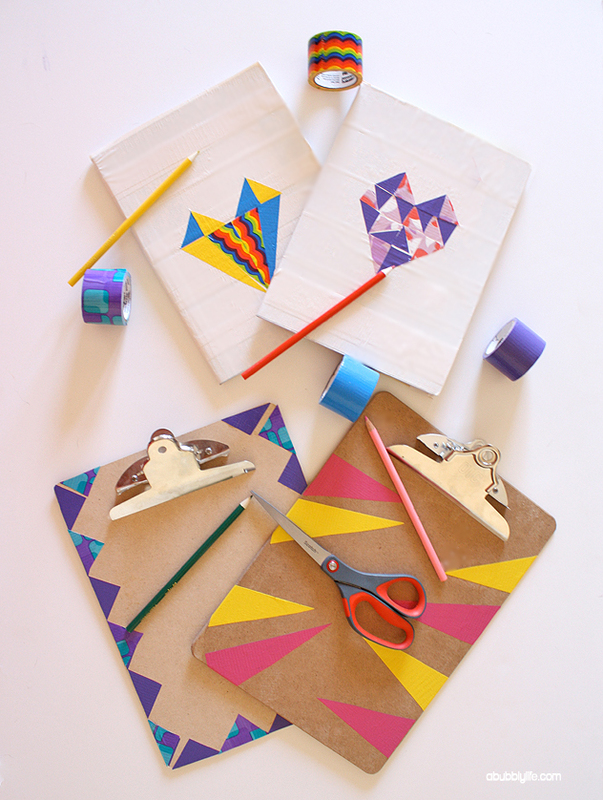 Back To School Notebook Makeover! 1) I wanted a clean slate to work with, so I first covered my black & white notebooks with Scotch’s Pearl White duct tape. 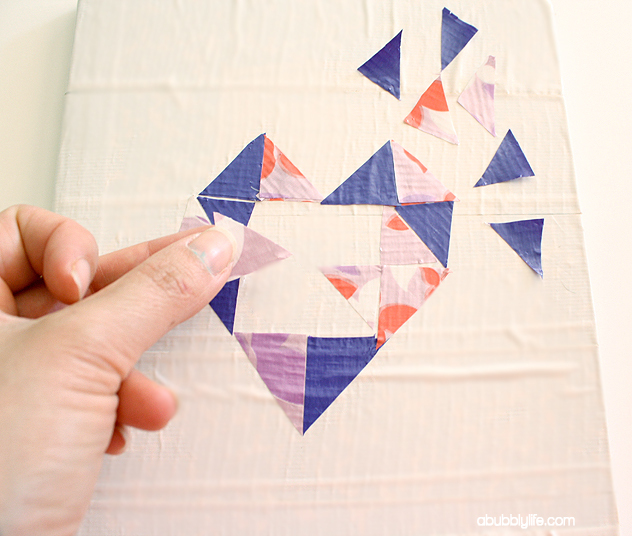 2) Grab your mat, craft knife, duct tape and ruler to begin making your triangles. 3) My ruler had a triangle on it- I used that shape to cut my triangles, however, any ruler will do. Just line up your duct tape and cut. The purple heart is made up of Violet Purple & Metallic Butterfly. 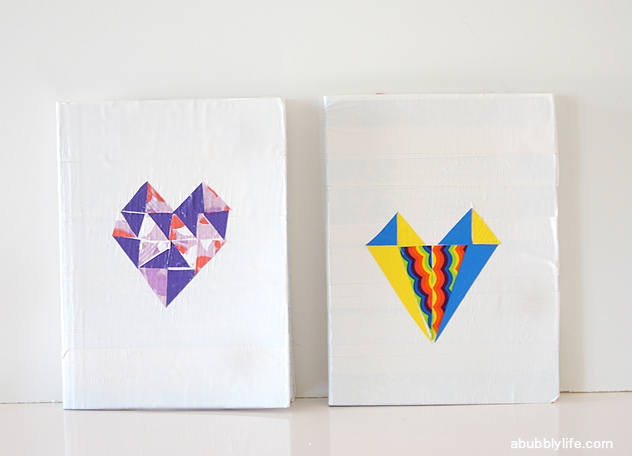 The other heart is ROY G BIV, Sunshine Yellow, and Sea Blue. 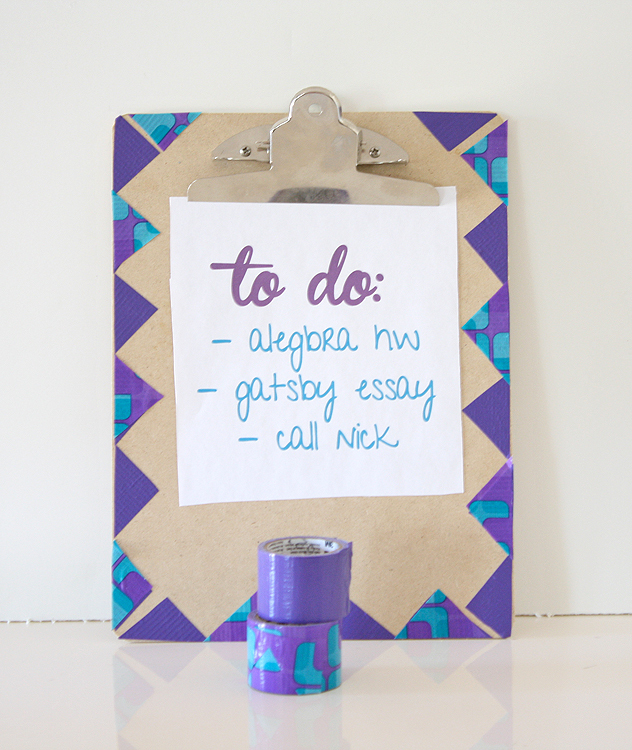 Clipboards are another office accessory addiction of mine and I had some fun changing them up from boring brown! 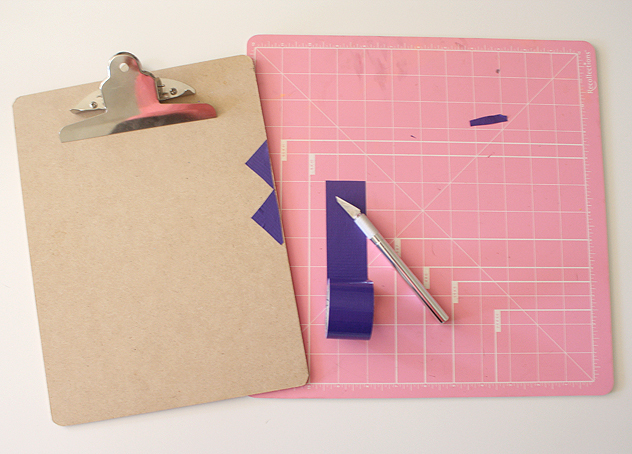 The materials (except use a clipboard) and directions are the same as the notebooks- Cut out your triangles on your self healing mat and apply. I did not use the ruler for the yellow and pink triangles as I wanted the sizes to be a little varied, so I did not need to measure each triangle. Thankfully if you make any mistakes, you can lift the tape up with your craft knife and remove- the tape is VERY forgiving to any errors! Hope you enjoy, please share and pin if you do! 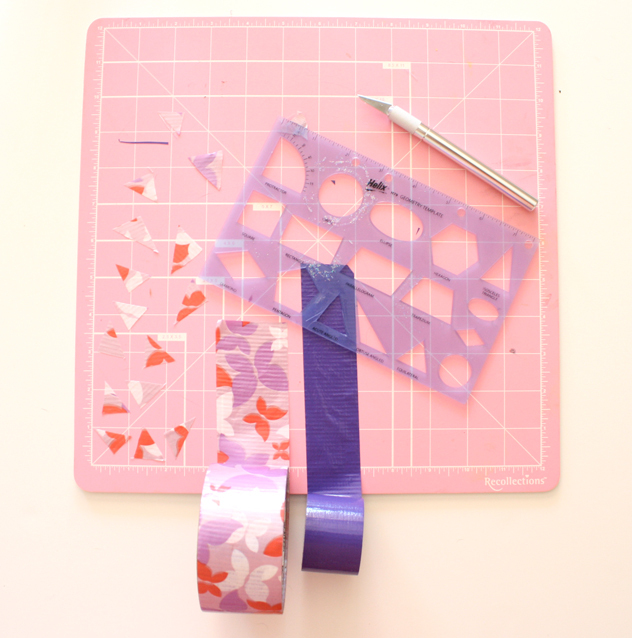 Check out Scotch® Color & Pattern Duct Tape on Twitter Facebook & Pinterest ! 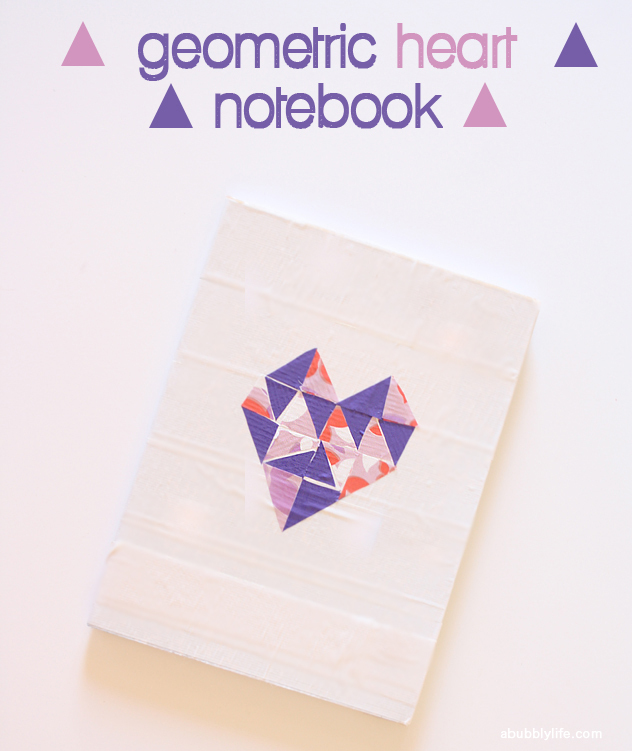 And check out their product page to view all the colors and patterns available- there is a tape design for everyone! 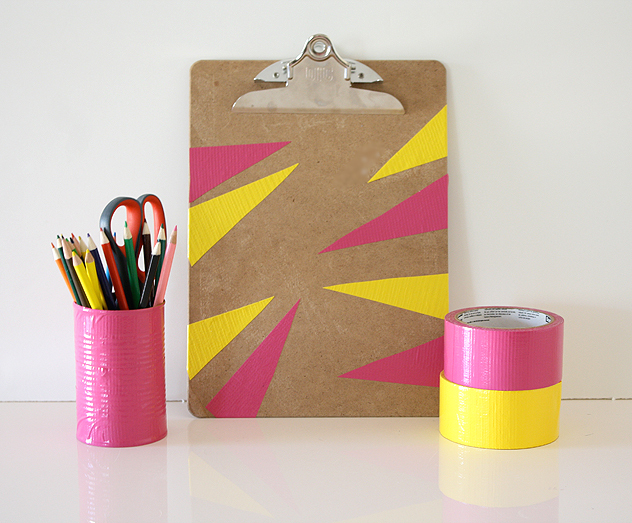 Disclaimer: This post is a collaboration with Scotch® Color & Pattern Duct Tape. All opinions are entirely my own and I only accept compensation and/or sponsorship from brands I trust and brands I think my readers would LOVE! Thank you so much for supporting sponsors that help support A Bubbly Life! « Kalia’s 2nd Birthday- Dress Up Party!